Some hiring managers recommend that job applicants begin their resume with a resume profile instead of an objective. But what’s the difference, and why might one be better than the other? A resume profile is a brief summary of an applicant’s skills, experiences, and goals as they relate to a specific job opening. On the other hand, a resume objective states the type of position that the applicant is seeking. Essentially, a profile is a very condensed version of a cover letter. Without restating your entire CV, it matches your qualifications to the job requirements. The intention is to show the hiring manager quickly and convincingly that you are the best person for the job. A resume profile is also referred to as career summary, personal profile statement, profile statement, resume summary, or summary of qualifications. All refer to profiling your key qualifications for the job on your resume. A resume profile offers applicants a way to stand out among the hundreds of resumes that companies receive. Most employers spend only a few seconds looking at a resume, and much of this time is spent looking at the top half of a resume. Therefore, even if employers only read your profile (located directly beneath your heading and contact information), they will still have a clear idea of your unique qualifications. In addition, your profile can include resume keywords that will help your application get picked up by the applicant tracking system that many companies use to screen applications for job openings. 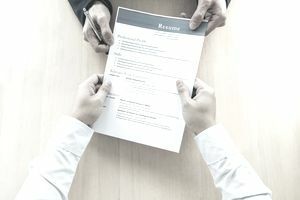 Stating an objective on your resume is a way to convince employers that you know what you want in a job, while a profile explains what you have to offer the employer and can help sell your candidacy. Another option is to not use either and simply start your resume with your most recent work experience. Some employers prefer resume profiles to resume objectives, but it's up to you to decide which works best for your resume considering your work experience, skills, level of position, and qualifications for the job for which you are applying. For example, while an objective might state, "Experienced English teacher seeking position at independent school," a profile might state, “English teacher with 10 years of experience in independent school systems. Success in developing creative teaching strategies to achieve passing grade levels on statewide exams." Unlike the objective, the profile answers the question, "What can this applicant offer the employer?" Keep Your Profile Concise. A resume profile should be between one and four (brief) sentences long. You can write your profile as a short paragraph or in bullet form. Focus on the Job Listing. In your profile, only include the skills and qualifications that relate to the specific job for which you are applying. A profile is particularly helpful if you have a work history that is unrelated to your current career goals—it allows you to highlight only your most relevant experience. Focus on the Future. A profile serves to show what you have to offer an employer—what you will do for the company in the future. Look at the job listing for insights into what the company is looking for in an employee. In your profile, explain how you will meet the company’s expectations. Does a sales director position require someone who can improve the company’s sales record? Your profile may state you are an "Accomplished sales director with success in developing strategies that have generated 6- and 7-figure revenue growth." Explain what you have done as a way of showing the hiring manager what you can and will do if they hire you. Location Matters. It's important that your resume objective is listed where an employer can see it when they first review your resume, so list your profile at the top of the page, above your work history. It's always helpful to review samples to get ideas for your own resume. Here are sample resume profiles for a variety of job openings. When writing your own profiles, try to integrate your employment history and skills into the qualifications listed in the job posting, so you appear, at first glance, well qualified for the job. What Are the Different Types of Resumes?